The engineers in THE LAB determined that an EASYHEATTM 5 kW induction soldering system with a single position four turn double wound helical coil would be optimal for the application. 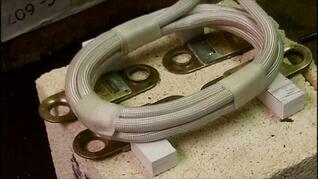 Four copper strips were placed under the coil approximately 0.25 inches (6.4 mm) away from it. The power was turned on and after seven seconds the larger parts began to separate indicating that the application achieved the target temperature of 400 ºF (204 ºC). A heating time of 10 seconds will ensure good flow. Placing the center of the coil turn over the center of the joint area offers the best performance for this application. Benefits of this solution from THE LAB include rapid heating which increases throughput, precise heating, flameless heating, and an induction system that requires a minimal footprint.